"Mesmerise" redirects here. For the song, see Mesmerise (song). "Hypnotized" and "Hypnotist" redirect here. For other uses, see Hypnotized (disambiguation) and Hypnotist (disambiguation). Hypnosis is a human condition involving focused attention, reduced peripheral awareness, and an enhanced capacity to respond to suggestion. The term may also refer to an art, skill, or act of inducing hypnosis. There are competing theories explaining hypnosis and related phenomena. Altered state theories see hypnosis as an altered state of mind or trance, marked by a level of awareness different from the ordinary state of consciousness. In contrast, nonstate theories see hypnosis as, variously, a type of placebo effect, a redefinition of an interaction with a therapist or form of imaginative role enactment. During hypnosis, a person is said to have heightened focus and concentration. Hypnotised subjects are said to show an increased response to suggestions. Hypnosis usually begins with a hypnotic induction involving a series of preliminary instructions and suggestion. The use of hypnotism for therapeutic purposes is referred to as "hypnotherapy", while its use as a form of entertainment for an audience is known as "stage hypnosis". Stage hypnosis is often performed by mentalists practicing the art form of mentalism. The use of hypnosis as a form of therapy to retrieve and integrate early trauma is controversial. Research indicates that hypnotizing an individual may actually aid the formation of false-memories. The term "hypnosis" comes from the ancient Greek word ύπνος hypnos, "sleep", and the suffix -ωσις -osis, or from ὑπνόω hypnoō, "put to sleep" (stem of aorist hypnōs-) and the suffix -is. 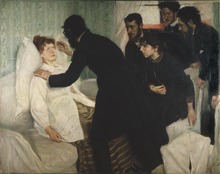 The words "hypnosis" and "hypnotism" both derive from the term "neuro-hypnotism" (nervous sleep), all of which were coined by Étienne Félix d'Henin de Cuvillers in 1820. These words were popularized in English by the Scottish surgeon James Braid (to whom they are sometimes wrongly attributed) around 1841. Braid based his practice on that developed by Franz Mesmer and his followers (which was called "Mesmerism" or "animal magnetism"), but differed in his theory as to how the procedure worked. A person in a state of hypnosis has focused attention, and has increased suggestibility. Janet, near the turn of the century, and more recently Ernest Hilgard ..., have defined hypnosis in terms of dissociation. Social psychologists Sarbin and Coe ... have described hypnosis in terms of role theory. Hypnosis is a role that people play; they act "as if" they were hypnotised. 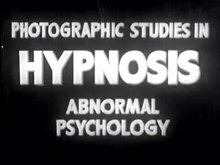 T. X. Barber ... defined hypnosis in terms of nonhypnotic behavioural parameters, such as task motivation and the act of labeling the situation as hypnosis. In his early writings, Weitzenhoffer ... conceptualised hypnosis as a state of enhanced suggestibility. Most recently ... he has defined hypnotism as "a form of influence by one person exerted on another through the medium or agency of suggestion." Psychoanalysts Gill and Brenman ... described hypnosis by using the psychoanalytic concept of "regression in the service of the ego". Edmonston ... has assessed hypnosis as being merely a state of relaxation. Spiegel and Spiegel... have implied that hypnosis is a biological capacity. Erickson ... is considered the leading exponent of the position that hypnosis is a special, inner-directed, altered state of functioning. Mesmer held the opinion that hypnosis was a sort of mystical force that flows from the hypnotist to the person being hypnotized, but his theory was dismissed by critics who asserted that there is no magical element to hypnotism. In as much as patients can throw themselves into the nervous sleep, and manifest all the usual phenomena of Mesmerism, through their own unaided efforts, as I have so repeatedly proved by causing them to maintain a steady fixed gaze at any point, concentrating their whole mental energies on the idea of the object looked at; or that the same may arise by the patient looking at the point of his own finger, or as the Magi of Persia and Yogi of India have practised for the last 2,400 years, for religious purposes, throwing themselves into their ecstatic trances by each maintaining a steady fixed gaze at the tip of his own nose; it is obvious that there is no need for an exoteric influence to produce the phenomena of Mesmerism. [...] The great object in all these processes is to induce a habit of abstraction or concentration of attention, in which the subject is entirely absorbed with one idea, or train of ideas, whilst he is unconscious of, or indifferently conscious to, every other object, purpose, or action. Avicenna (980–1037), a Persian physician, documented the characteristics of the "trance" (Hypnotic Trance) state in 1027. At that time, hypnosis as a medical treatment was seldom used; the German doctor Franz Mesmer reintroduced it in the 18th century. Franz Mesmer (1734–1815) believed that there is a magnetic force or "fluid" called "animal magnetism" within the universe that influences the health of the human body. He experimented with magnets to affect this field in order to produce healing. By around 1774, he had concluded that the same effect could be created by passing the hands in front of the subject's body, later referred to as making "Mesmeric passes". The word "mesmerize", formed from the last name of Franz Mesmer, was intentionally used to separate practitioners of mesmerism from the various "fluid" and "magnetic" theories included within the label "magnetism". In writing the majority opinion, Franklin said: "This fellow Mesmer is not flowing anything from his hands that I can see. Therefore, this mesmerism must be a fraud." Mesmer left Paris and went back to Vienna to practise mesmerism. In Braid's day, the Scottish School of Common Sense provided the dominant theories of academic psychology, and Braid refers to other philosophers within this tradition throughout his writings. Braid therefore revised the theory and practice of Mesmerism and developed his own method of hypnotism as a more rational and common sense alternative. Émile Coué developed autosuggestion as a psychological technique. The therapeutic practices of hypnotherapy and various forms of cognitive behavioural therapy overlapped and influenced each other. Hypnotherapy is viewed as a helpful adjunct by proponents, having additive effects when treating psychological disorders, such as these, along with scientifically proven cognitive therapies. Hypnotherapy should not be used for repairing or refreshing memory because hypnosis results in memory hardening, which increases the confidence in false memories. The effectiveness of hypnotherapy has not yet been accurately assessed, and, due to the lack of evidence indicating any level of efficiency, it is regarded as a type of alternative medicine by numerous reputable medical organisations, such as the NHS. Barrett described specific ways this is operationalized for habit change and amelioration of phobias. In her 1998 book of hypnotherapy case studies, she reviews the clinical research on hypnosis with dissociative disorders, smoking cessation, and insomnia, and describes successful treatments of these complaints. American psychiatric nurses, in most medical facilities, are allowed to administer hypnosis to patients in order to relieve symptoms such as anxiety, arousal, negative behaviours, uncontrollable behaviour, and to improve self-esteem and confidence. This is permitted only when they have been completely trained about their clinical side effects and while under supervision when administering it. It would be difficult to find an area of scientific interest more beset by divided professional opinion and contradictory experimental evidence... No one can say whether hypnosis is a qualitatively unique state with some physiological and conditioned response components or only a form of suggestion induced by high motivation and a positive relationship between hypnotist and subject... T.X. Barber has produced "hypnotic deafness" and "hypnotic blindness", analgesia and other responses seen in hypnosis—all without hypnotizing anyone... Orne has shown that unhypnotized persons can be motivated to equal and surpass the supposed superhuman physical feats seen in hypnosis. The idea of music as hypnosis developed from the work of Franz Mesmer. Instruments such as pianos, violins, harps and, especially, the glass armonica often featured in Mesmer's treatments; and were considered to contribute to Mesmer's success. Various people have been suspected of or convicted for hypnosis-related crimes, including robbery and sexual abuse. In 1951, Palle Hardrup shot and killed two people during a botched robbery in Copenhagen. Hardrup claimed that his friend and former cellmate Bjørn Schouw Nielsen had hypnotized him to commit the robbery, inadvertently causing the deaths. Both were sentenced to jail time. Put simply, it is often claimed that, whereas the older "special state" interpretation emphasises the difference between hypnosis and ordinary psychological processes, the "nonstate" interpretation emphasises their similarity. Comparisons between hypnotised and non-hypnotised subjects suggest that, if a "hypnotic trance" does exist, it only accounts for a small proportion of the effects attributed to hypnotic suggestion, most of which can be replicated without hypnotic induction. Pavlov's ideas combined with those of his rival Vladimir Bekhterev and became the basis of hypnotic psychotherapy in the Soviet Union, as documented in the writings of his follower K.I. Platonov. Soviet theories of hypnotism subsequently influenced the writings of Western behaviourally oriented hypnotherapists such as Andrew Salter. Studies have shown an association of hypnosis with stronger theta-frequency activity as well as with changes to the gamma-frequency activity. Neuroimaging techniques have been used to investigate neural correlates of hypnosis. ^ Lynn SJ, Green JP, Kirsch I, Capafons A, Lilienfeld SO, Laurence JR, Montgomery GH (April 2015). "Grounding Hypnosis in Science: The "New" APA Division 30 Definition of Hypnosis as a Step Backward". The American Journal of Clinical Hypnosis. 57 (4): 390–401. doi:10.1080/00029157.2015.1011472. PMID 25928778. ^ Encyclopædia Britannica, 2004: "a special psychological state with certain physiological attributes, resembling sleep only superficially and marked by a functioning of the individual at a level of awareness other than the ordinary conscious state". ^ Erika Fromm; Ronald E. Shor (2009). Hypnosis: Developments in Research and New Perspectives. Rutgers. ISBN 978-0-202-36262-5. Retrieved 27 September 2014. ^ Kirsch I (October 1994). "Clinical hypnosis as a nondeceptive placebo: empirically derived techniques". The American Journal of Clinical Hypnosis. 37 (2): 95–106. doi:10.1080/00029157.1994.10403122. PMID 7992808. ^ Theodore X. Barber (1969). Hypnosis: A Scientific Approach. J. Aronson, 1995. ISBN 9781568217406. ^ Lynn S, Fassler O, Knox J (2005). "Hypnosis and the altered state debate: something more or nothing more?". Contemporary Hypnosis. 22: 39–45. doi:10.1002/ch.21. ^ Coe WC, Buckner LG, Howard ML, Kobayashi K (July 1972). "Hypnosis as role enactment: focus on a role specific skill". The American Journal of Clinical Hypnosis. 15 (1): 41–5. doi:10.1080/00029157.1972.10402209. PMID 4679790. ^ Steven J. Lynn; Judith W. Rhue (4 October 1991). Theories of hypnosis: current models and perspectives. Guilford Press. ISBN 978-0-89862-343-7. Retrieved 30 October 2011. ^ Lyda, Alex. "Hypnosis Gaining Ground in Medicine." Columbia News. Columbia.edu. Retrieved on 2011-10-01. ^ Lynn SJ, Lock T, Loftus EF. "The remembrance of things past: Problematic memory recovery techniques in psychotherapy". PsycNET. Retrieved 11 March 2019. ^ Hall, Celia. "Hypnosis does not help accurate memory recall, says study". Telegraph. Retrieved 11 March 2019. ^ hypnos, hypnoō. Liddell, Henry George; Scott, Robert; A Greek–English Lexicon at the Perseus Project. ^ Harper, Douglas. "hypnosis". Online Etymology Dictionary. ^ "hypnosis." Encyclopædia Britannica web edition. Retrieved: 20 March 2016. ^ Scheflin, A.W. & Shapiro, J.L., Trance on Trial, The Guildford Press, (New York), 1989, pp.123-126. It must be stressed that, whilst these are ‘typical’ manifestations of the presence of the ‘hypnotic state’, none of them are unique to hypnotism. ^ Scheflin and Shapiro noted that "[the] more complete experiences of ideosensory activity include both positive and negative hallucinations" (p.124). ^ Which Scheflin and Shapiro defined as "the involuntary capacity of the muscles to respond instantaneously to external stimuli" (p.124). ^ "Glove anesthesia" (with respect to hands and arms), or "stocking anesthesia" (with respect to feet and legs) refers to the insensitivity to external stimuli or to pain (not due to polyneuropathy) in a part of the body. ^ Which Scheflin and Shapiro defined as "one of the deepest states of hypnotism, characterized by deep trance-like sleep walking" (p.125). ^ Fromm E, Shor RE (29 December 2017). Hypnosis: Developments in Research and New Perspectives. Transaction Publishers. ISBN 9780202366692 – via Google Books. ^ Braid 1843, p. 12. ^ Braid, J., Hypnotic Therapeutics: Illustrated by Cases : with an Appendix on Table-moving and Spirit-rapping, Murray and Gibb, printers, 1853. Quoted in Braid, J., The Discovery of Hypnosis: The Complete Writings of James Braid, the Father of Hypnotherapy, UKCHH Ltd., 2008, p. 33. ^ Braid, J., The Discovery of Hypnosis: The Complete Writings of James Braid, the Father of Hypnotherapy, UKCHH Ltd, 2008, p. 79. ^ Leslie M (6 September 2000). "Research supports the notion that hypnosis can transform perception". Stanford University. ^ Mauer MH, Burnett KF, Ouellette EA, Ironson GH, Dandes HM (April 1999). "Medical hypnosis and orthopedic hand surgery: pain perception, postoperative recovery, and therapeutic comfort". The International Journal of Clinical and Experimental Hypnosis. 47 (2): 144–61. doi:10.1080/00207149908410027. PMID 10208075. ^ De Pascalis V, Magurano MR, Bellusci A (December 1999). "Pain perception, somatosensory event-related potentials and skin conductance responses to painful stimuli in high, mid, and low hypnotizable subjects: effects of differential pain reduction strategies". Pain. 83 (3): 499–508. doi:10.1016/S0304-3959(99)00157-8. PMID 10568858. INIST:1291393. ^ "New Definition: Hypnosis". Society of Psychological Hypnosis Division 30 – American Psychological Association. ^ a b Nash, M., in Lynn, SJ, Rhue, JW., (eds. ), Theories of Hypnosis: Current Models and Perspectives, Guilford Press, 1991, pp. 277-278. ^ Griffin J, Tyrrell I (2013). Human Givens: The new approach to emotional health and clear thinking. HG Publishing. p. 67. ISBN 978-1-899398-31-7. ^ Roffwarg HP, Muzio JN, Dement WC (April 1966). "Ontogenetic development of the human sleep-dream cycle". Science. 152 (3722): 604–19. Bibcode:1966Sci...152..604R. doi:10.1126/science.152.3722.604. PMID 17779492. ^ Does a genetic programming of the brain occur during paradoxical sleep (1978) by M Jouvet in editors, Buser PA, Rougeul-Buser A (1978). Cerebral correlates of conscious experience : proceedings of an international symposium on cerebral correlates of conscious experience, held in Senanque Abbey, France, on 2-8 august 1977. New York: North-Holland. ISBN 978-0-7204-0659-7. ^ Griffin J, Tyrrell I (2011). Godhead : the brain's big bang : the strange origin of creativity, mysticism and mental illness. Chalvington: Human Givens. pp. 106–122. ISBN 978-1-899398-27-0. ^ Weitzenhoffer & Hilgard (1959). Stanford Hypnotic Susceptibility Scales, Forms A & B. Palo Alto, CA: Consulting Psychologists Press. ^ Braid (1843), p. 27. ^ a b c d e Barber, TX, Spanos, NP. & Chaves, JF., Hypnosis, imagination, and human potentialities. Pergamon Press, 1974. ISBN 0-08-017931-2. ^ White, Robert W. (1941). "A preface to the theory of hypnotism". Journal of Abnormal & Social Psychology. 36 (4): 477–505 (498). doi:10.1037/h0053844. ^ Bernheim, H., Hypnosis & suggestion in psychotherapy: a treatise on the nature and uses of hypnotism. Tr. from the 2d rev. ed., University Books, 1964, p. 15. ^ Barrett D (1998). The Pregnant Man: Cases from a Hypnotherapist's Couch. Times Books. ^ a b c Rossi EL, Rossi KL (April 2007). "What is a suggestion? The neuroscience of implicit processing heuristics in therapeutic hypnosis and psychotherapy" (PDF). American Journal of Clinical Hypnosis. 49 (4). ^ Lovatt WF (1933–34). "Hypnosis and suggestion" (PDF). Rider & Co.
^ Braid, J., Hypnotic Therapeutics: Illustrated by Cases : with an Appendix on Table-moving and Spirit-rapping, Murray and Gibb, printers, 1853. Quoted in Braid, J., The Discovery of Hypnosis: The Complete Writings of James Braid, the Father of Hypnotherapy, UKCHH Ltd., 2008, p. 32. ^ Braid, J., Hypnotic Therapeutics: Illustrated by Cases : with an Appendix on Table-moving and Spirit-rapping, Murray and Gibb, printers, 1853. Quoted in Braid, J., The Discovery of Hypnosis: The Complete Writings of James Braid, the Father of Hypnotherapy, UKCHH Ltd., 2008, p. 34. ^ Barrett, Deirdre. Deep Trance Subjects: A Schema of Two Distinct Subgroups. in R. Kunzendorf (Ed.) Imagery: Recent Developments, NY: Plenum Press, 1991, pp. 101–112. ^ Barrett D (December 1992). "Fantasizers and dissociaters: data on two distinct subgroups of deep trance subjects". Psychological Reports. 71 (3 Pt 1): 1011–4. doi:10.2466/pr0.1992.71.3.1011. PMID 1454907. ^ Spiegel D, Loewenstein RJ, Lewis-Fernández R, Sar V, Simeon D, Vermetten E, Cardeña E, Dell PF (September 2011). "Dissociative disorders in DSM-5" (PDF). Depression and Anxiety. 28 (9): 824–52. doi:10.1002/da.20874. PMID 21910187. Archived from the original (PDF) on 1 May 2013. ^ Braid, J. (1844/1855), "Magic, Mesmerism, Hypnotism, etc., etc. Historically and Physiologically Considered", The Medical Times, Vol.11, No.272, (7 December 1844), pp.203-204, No.273, (14 December 1844), p.224-227, No.275, (28 December 1844), pp.270-273, No.276, (4 January 1845), pp.296-299, No.277, (11 January 1845), pp.318-320, No.281, (8 February 1845), pp.399-400, and No.283, (22 February 1845), pp.439-441: at p.203. ^ Braid, J. (1846). "The Power of the Mind over the Body: An Experimental Inquiry into the nature and cause of the Phenomena attributed by Baron Reichenbach and others to a 'New Imponderable – Hypnosis explained'". The Edinburgh Medical and Surgical Journal. 66: 286–311. Archived from the original on 23 May 2010. ^ Collin C, et al. (2011). The psychology book. London: Dorling Kindersley. p. 22. ISBN 978-1-4053-9124-5. ^ a b Dugald Stewart (1818). Elements of the philosophy of the human mind. Wells and Lilly. p. 147. Retrieved 1 October 2011. ^ Braid, J. Magic, Witchcraft, etc., 1852: 41–42. ^ Braid, James (2009). Robertson, D. (ed.). The Discovery of Hypnosis: The Complete Writings of James Braid, the Father of Hypnotherapy. UKCHH Ltd. p. 72. ISBN 978-0-9560570-0-6. ^ Braid, James (2009). Robertson, D. (ed.). The Discovery of Hypnosis: The Complete Writings of James Braid, the Father of Hypnotherapy. UKCHH Ltd. p. 23. ISBN 978-0-9560570-0-6. ^ Braid, James (2009). Robertson, D. (ed.). The Discovery of Hypnosis: The Complete Writings of James Braid, the Father of Hypnotherapy. UKCHH Ltd. p. 55. ISBN 978-0-9560570-0-6. ^ Encyclopædia Britannica. Entry for Janet, Pierre. ^ Braid, James (2009). Robertson, D. (ed.). The Discovery of Hypnosis: The Complete Writings of James Braid, the Father of Hypnotherapy. UKCHH Ltd. p. 56. ISBN 978-0-9560570-0-6. ^ See Yeates, 2016a, 2016b, and 2016c. ^ Baudouin continuously spoke of a “New Nancy School”: e.g., Baudouin (1920), p.13. ^ It is significant that Coué never adopted Baudouin’s designation "New Nancy School"; and, moreover, according to Glueck (1923, p.112), who visited Coué at Nancy in 1922, Coué was “rather annoyed” with Baudouin’s unauthorized characterization of his enterprise. ^ André Muller Weitzenhoffer (2000). The practice of hypnotism. John Wiley and Sons. pp. 419–. ISBN 978-0-471-29790-1. Retrieved 30 October 2011. ^ Sarbin, T.R. & Coe, W.C. (1972). Hypnosis: A Social Psychological Analysis of Influence Communication. ^ Assen Alladin (21 April 2008). Cognitive hypnotherapy: an integrated approach to the treatment of emotional disorders. John Wiley and Sons. ISBN 978-0-470-03247-3. Retrieved 30 October 2011. ^ a b c Robertson, D (2012). The Practice of Cognitive-Behavioural Hypnotherapy: A Manual for Evidence-Based Clinical Hypnosis. London: Karnac. ISBN 978-1-85575-530-7. ^ a b Robin A. Chapman (2006). The clinical use of hypnosis in cognitive behavior therapy: a practitioner's casebook. Springer Publishing Company. ISBN 978-0-8261-2884-3. Retrieved 30 October 2011. ^ Wolpe, J. (1958) Psychotherapy by Reciprocal Inhibition. ^ Ellis, A. (1962). Reason & Emotion in Psychotherapy. ^ Hull, C.L. (1933). Hypnosis & Suggestibility. ^ a b Braid J (1843). Neurypnology or The rationale of nervous sleep considered in relation with animal magnetism. Buffalo, N.Y.: John Churchill. 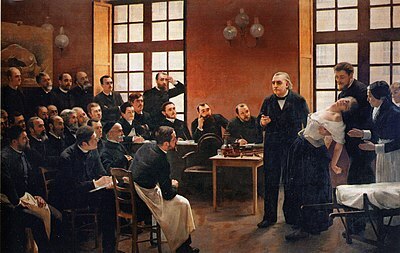 ^ See: A Clinical Lesson at the Salpêtrière. ^ Hypnosis, American Society of Clinical. "Account Login". www.asch.net. ^ Chapman, Robin (August 2005). Clinical Use of Hypnosis in Cognitive Behavior Therapy : A Practitioner's Casebook. Springer Publisher Company. p. 6. ^ Fogel S, Hoffer A (1962). "The use of hypnosis to interrupt and to reproduce an LSD-25 experience". Journal of Clinical and Experimental Psychopathology & Quarterly Review of Psychiatry and Neurology. 23: 11–6. PMID 13893766. ^ Van Quekelberghe R, Göbel P, Hertweck E (1995). "Simulation of near-death and out-of-body experiences under hypnosis". Imagination, Cognition & Personality. 14 (2): 151–164. doi:10.2190/gdfw-xlel-enql-5wq6. ^ "Using Hypnosis to Encourage Mystical Experience" Archived 29 January 2010 at the Wayback Machine. Counselinginoregon.com. Retrieved on 2011-10-01. ^ "History of the Stage Hypnotist and Stage Hypnosis Shows." Archived 1 December 2017 at the Wayback Machine. stagehypnosisshow.co.uk. Retrieved on 2015-01-23. ^ "Australian Society of Clinical Hypnotherapists". Archived from the original on 26 January 2016. ^ Dubin, William. "Compulsive Gaming" (2006). Psycharts.com. Retrieved on 2011-10-01. ^ a b Deirdre Barrett (21 July 1998). The Pregnant Man: Tales from a Hypnotherapist's Couch (1998/hardback, 1999 paper ed.). NY: Times Books/Random House. ISBN 978-0-8129-2905-8. ^ Assen Alladin (15 May 2008). Cognitive hypnotherapy: an integrated approach to the treatment of emotional disorders. J. Wiley. ISBN 978-0-470-03251-0. Retrieved 30 October 2011. ^ Novella, S. (Producer). (2007, July 11). The Skeptic's Guide to the Universe [Audio podcast]. ^ Abbot NC, Stead LF, White AR, Barnes J (1998). "Hypnotherapy for smoking cessation". Cochrane Database of Systematic Reviews. doi:10.1002/14651858.CD001008. ^ Kraft T, Kraft D (2005). "Covert sensitization revisited: Six case studies" (PDF). Contemporary Hypnosis. 22 (4): 202–209. doi:10.1002/ch.10. Archived from the original (PDF) on 19 January 2012. ^ Elkins GR, Rajab MH (January 2004). "Clinical hypnosis for smoking cessation: preliminary results of a three-session intervention". The International Journal of Clinical and Experimental Hypnosis. 52 (1): 73–81. doi:10.1076/iceh.52.1.73.23921. PMID 14768970. ^ Gow MA (2006). "Hypnosis with a blind 55-year-old female with dental phobia requiring periodontal treatment and extraction". Contemporary Hypnosis. 23 (2): 92–100. doi:10.1002/ch.313. ^ Nicholson J. "Hypnotherapy – Case History – Phobia". London College of Clinical Hypnosis. Archived from the original on 29 June 2005. ^ Wijesnghe B (1974). "A vomiting phobia overcome by one session of flooding with hypnosis" (PDF). Journal of Behavioural Therapy and Experimental Psychiatry. 5 (2): 169–170. doi:10.1016/0005-7916(74)90107-4. ^ Deyoub PL, Epstein SJ (April 1977). "Short-term hypnotherapy for the treatment of flight phobia: a case report". The American Journal of Clinical Hypnosis. 19 (4): 251–4. doi:10.1080/00029157.1977.10403885. PMID 879063. ^ Rogers J (May 2008). "Hypnosis in the treatment of social phobia". Australian Journal of Clinical & Experimental Hypnosis. 36 (1): 64–68. ^ "Hypnosis. Another way to manage pain, kick bad habits". mayoclinic.com. Archived from the original on 4 December 2009. ^ Anbar RD (January 2009). "Childhood habit cough treated with consultation by telephone: a case report". Cough. 5 (2): 2. CiteSeerX 10.1.1.358.6608. doi:10.1186/1745-9974-5-2. PMC 2632985. PMID 19159469. ^ McNeilly R (September 1994). "Solution oriented hypnosis. An effective approach in medical practice". Australian Family Physician. 23 (9): 1744–6. PMID 7980173. ^ "Hypnosis for Pain.". Webmd.com. Retrieved on 2011-10-01. ^ Patterson DR, Ptacek JT (February 1997). "Baseline pain as a moderator of hypnotic analgesia for burn injury treatment". Journal of Consulting and Clinical Psychology. 65 (1): 60–7. doi:10.1037/0022-006X.65.1.60. PMID 9103735. ^ American Psychological Association (2 July 2004). "Hypnosis for the Relief and Control of Pain". American Psychological Association. ^ Vickers A, Zollman C (November 1999). "ABC of complementary medicine. Hypnosis and relaxation therapies". Bmj. 319 (7221): 1346–9. doi:10.1136/bmj.319.7221.1346. PMC 1117083. PMID 10567143. ^ Pates J, Palmi J (2002). "The effects of hypnosis on flow-states and performance" (PDF). Journal of Excellence. 6: 48–61. ^ Kirsch I (June 1996). "Hypnotic enhancement of cognitive-behavioral weight loss treatments--another meta-reanalysis". Journal of Consulting and Clinical Psychology. 64 (3): 517–9. doi:10.1037/0022-006X.64.3.517. PMID 8698945. ^ a b Bolocofsky DN, Spinler D, Coulthard-Morris L (January 1985). "Effectiveness of hypnosis as an adjunct to behavioral weight management" (PDF). Journal of Clinical Psychology. 41 (1): 35–41. doi:10.1002/1097-4679(198501)41:1<35::AID-JCLP2270410107>3.0.CO;2-Z. PMID 3973038. Archived from the original (PDF) on 8 December 2013. ^ Cochrane G, Friesen J (August 1986). "Hypnotherapy in weight loss treatment" (PDF). Journal of Consulting and Clinical Psychology. 54 (4): 489–92. doi:10.1037/0022-006X.54.4.489. PMID 3745601. Archived from the original (PDF) on 8 December 2013. ^ Gonsalkorale WM, Whorwell PJ (January 2005). "Hypnotherapy in the treatment of irritable bowel syndrome". European Journal of Gastroenterology & Hepatology. 17 (1): 15–20. doi:10.1097/00042737-200501000-00004. PMID 15647634. ^ Patterson DR, Questad KA, de Lateur BJ (January 1989). "Hypnotherapy as an adjunct to narcotic analgesia for the treatment of pain for burn debridement". The American Journal of Clinical Hypnosis. 31 (3): 156–63. doi:10.1080/00029157.1989.10402884. PMID 2563925. ^ Mendoza ME, Capafons A (2009). "Efficacy of clinical hypnosis: A summary of its empirical evidence" (PDF). Papeles del Psicólogo. 30 (2): 98–116. Archived from the original (PDF) on 8 January 2013. ^ Ewin DM (2001). "The use of hypnosis in the treatment of burn patients" (PDF). International Handbook of Clinical Hypnosis: 274–283. ^ "Hypnosis may help reduce fear of cancer treatment in children: Hypnosis could help to reduce the fear of medical procedures in children and young people with cancer". ScienceDaily. Retrieved 22 June 2018. ^ Butler B (January 1954). "The use of hypnosis in the care of the cancer patient" (PDF). Cancer. 7 (1): 1–14. doi:10.1002/1097-0142(195401)7:1<1::AID-CNCR2820070103>3.0.CO;2-0. PMID 13126897. ^ Peynovska R, Fisher J, Oliver D, Matthew VM (2003). "Efficacy of hypnotherapy as a supplement therapy in cancer intervention" (PDF). Paper presented at the Annual Meeting of The Royal College of Psychiatrists, 30 June – 3 July 2003. ^ Spiegel D, Moore R (August 1997). "Imagery and hypnosis in the treatment of cancer patients". Oncology. 11 (8): 1179–89, discussion 1189-95. PMID 9268979. ^ Garrow D, Egede LE (November 2006). "National patterns and correlates of complementary and alternative medicine use in adults with diabetes". Journal of Alternative and Complementary Medicine. 12 (9): 895–902. doi:10.1089/acm.2006.12.895. PMID 17109581. ^ Mascott C (2004). "Hypnotherapy. A complementary therapy with broad applications". Diabetes Self-Management. 21 (5): 15–8. PMID 15586907. ^ Kwekkeboom KL, Gretarsdottir E (2006). "Systematic review of relaxation interventions for pain". Journal of Nursing Scholarship. 38 (3): 269–77. doi:10.1111/j.1547-5069.2006.00113.x. PMID 17044345. ^ "Hypnosis". American Cancer Society. November 2008. Retrieved 22 September 2013. ^ Jerjes W, Hopper C, Kumar M, Upile T, Madland G, Newman S, Feinmann C (March 2007). "Psychological intervention in acute dental pain: review". British Dental Journal. 202 (6): 337–43. doi:10.1038/bdj.2007.227. PMID 17384613. ^ Meyerson J, Uziel N. "Application of hypno-dissociative strategies during dental treatment of patients with severe dental phobia". The International Journal of Clinical and Experimental Hypnosis. 62 (2): 179–87. doi:10.1080/00207144.2014.869129. PMID 24568324. ^ Myers, David G. (2014). Psychology: Tenth Edition in Modules (10th ed.). Worth Publishers. pp. 112–13. ^ O'Connor, Anahad (28 September 2004). "The Claim: Hypnosis Can Help You Stop Smoking". The New York Times. ^ "Hypnotherapy for Smoking Cessation Sees Strong Results". ScienceDaily. 24 October 2007. Retrieved 1 October 2011. ^ Greetham S, Goodwin S, Wells L, Whitham C, Jones H, Rigby A, Sathyapalan T, Reid M, Atkin S (1 October 2016). "Pilot Investigation of a Virtual Gastric Band Hypnotherapy Intervention". The International Journal of Clinical and Experimental Hypnosis. 64 (4): 419–33. doi:10.1080/00207144.2016.1209037. PMID 27585726. ^ "Questions and Answers about Memories of Childhood Abuse". American Psychological Association. Archived from the original on 5 December 2006. Retrieved 22 January 2007. ^ Astin JA, Shapiro SL, Eisenberg DM, Forys KL (2003). "Mind-body medicine: state of the science, implications for practice". The Journal of the American Board of Family Practice. 16 (2): 131–47. CiteSeerX 10.1.1.501.9041. doi:10.3122/jabfm.16.2.131. PMID 12665179. ^ "Department of Psychiatry and Neurobehavioral Sciences – University of Virginia School of Medicine" (PDF). Medicine.virginia.edu. Retrieved 20 September 2018. ^ Valente, M.S. (2003). "Hypnosis: A Useful Strategy for Symptom Relief". Journal of the American Psychiatric Nurses Association. 9 (5): 163–166. doi:10.1016/S1078-3903(03)00226-X. ^ "Self-hypnosis as a skill for busy research workers." London's Global University Human Resources. ucl.ac.uk. ^ Yapko, Michael (1990). Trancework: An introduction to the practice of Clinical Hypnosis. NY, New York: Brunner/Mazel. p. 28. ^ Polter 1934, p. 15. See also Franklin 1785, p. 23. Gallo and Finger 2000; Hadlock 2000a; Hyatt King 1945. ^ Pavlov 1928; Todes 2002. ^ Godwin 1986, 1995; Peters and Peters 1985. ^ Raschke 1990, pp. 56, 161–77. ^ Martinsen, Poul (2012). Hypnosemorderen - dobbeltmennesket Palle Hardrup (in Danish). Gyldendal. ISBN 978-87-02-12200-8. ^ Clarke-Billings L (28 September 2015). "Hypnotist jailed for ten years after sexually assaulting woman under his spell". ISSN 0307-1235. Retrieved 1 November 2017. ^ Darlington S (11 December 2018). "Celebrity Healer in Brazil Is Accused of Sexually Abusing Followers". The New York Times. ISSN 0362-4331. Retrieved 12 December 2018. ^ "Twelve Women Accuse Medium John of God of Sexual Abuse". 9 December 2018. ^ White, R.W. (1941). "A preface to the theory of hypnotism". Journal of Abnormal Psychology. 36 (4): 477–505. doi:10.1037/h0053844. ^ Clark Leonard Hull (1933). Hypnosis and suggestibility: an experimental approach. D. Appleton-Century company, inc. p. 392. Retrieved 30 October 2011. ^ Barker W, Burgwin S (1948). "Brain wave patterns accompanying changes in sleep and wakefulness during hypnosis". Psychosomatic Medicine. 10 (6): 317–26. doi:10.1097/00006842-194811000-00002. PMID 18106841. ^ Raz A, Fan J, Posner MI (July 2005). "Hypnotic suggestion reduces conflict in the human brain". Proceedings of the National Academy of Sciences of the United States of America. 102 (28): 9978–83. Bibcode:2005PNAS..102.9978R. doi:10.1073/pnas.0503064102. PMC 1174993. PMID 15994228. ^ Derbyshire SW, Whalley MG, Stenger VA, Oakley DA (September 2004). "Cerebral activation during hypnotically induced and imagined pain". NeuroImage. 23 (1): 392–401. doi:10.1016/j.neuroimage.2004.04.033. PMID 15325387. ^ Grossman ED, Blake R (2001). "Brain activity evoked by inverted and imagined biological motion". Vision Research. 41 (10–11): 1475–82. doi:10.1016/S0042-6989(00)00317-5. PMID 11322987. ^ Kosslyn SM, Thompson WL, Costantini-Ferrando MF, Alpert NM, Spiegel D (August 2000). "Hypnotic visual illusion alters color processing in the brain". The American Journal of Psychiatry. 157 (8): 1279–84. doi:10.1176/appi.ajp.157.8.1279. PMID 10910791. ^ Horton, Crawford (2004). The Highly Hypnotisable Subject. p. 140. ^ Jensen MP, Adachi T, Hakimian S (January 2015). "Brain Oscillations, Hypnosis, and Hypnotizability". The American Journal of Clinical Hypnosis (Review). 57 (3): 230–53. doi:10.1080/00029157.2014.976786. PMC 4361031. PMID 25928684. ^ Mazzoni G, Venneri A, McGeown WJ, Kirsch I (February 2013). "Neuroimaging resolution of the altered state hypothesis". Cortex; A Journal Devoted to the Study of the Nervous System and Behavior (Review). 49 (2): 400–10. doi:10.1016/j.cortex.2012.08.005. PMID 23026758. ^ Landry M, Raz A (January 2015). "Hypnosis and imaging of the living human brain". The American Journal of Clinical Hypnosis (Review). 57 (3): 285–313. doi:10.1080/00029157.2014.978496. PMID 25928680. ^ Gosline A (10 September 2004). "Hypnosis really changes your mind". New Scientist. Retrieved 27 August 2007. ^ Egner T, Jamieson G, Gruzelier J (October 2005). "Hypnosis decouples cognitive control from conflict monitoring processes of the frontal lobe". NeuroImage. 27 (4): 969–78. doi:10.1016/j.neuroimage.2005.05.002. PMID 15964211. ^ Morgan J.D. (1993). The Principles of Hypnotherapy. Eildon Press. ^ Michel Weber is working on a Whiteheadian interpretation of hypnotic phenomena: see his « Hypnosis: Panpsychism in Action », in Michel Weber and William Desmond, Jr. (eds. ), Handbook of Whiteheadian Process Thought, Frankfurt / Lancaster, ontos verlag, Process Thought X1 & X2, 2008, I, pp. 15-38, 395-414 ; cf. « Syntonie ou agencement ethnopsychiatrique ? », Michel Weber et Vincent Berne (sous la direction de), Chromatikon IX. Annales de la philosophie en procès — Yearbook of Philosophy in Process, Les Editions Chromatika, 2013, pp. 55-68. Baudouin, C. (Paul, E & Paul, C. trans. ), Suggestion and Autosuggestion: A Psychological and Pedagogical Study Based on the Investigations made by the New Nancy School, George Allen & Unwin, (London), 1920. Braid J (1843). Neurypnology or The rationale of nervous sleep considered in relation with animal magnetism. London. : John Churchill. Blackwell W (2015). The Handbook of Contemporary Clinical Hypnosis: Theory and Practice. ISBN 978-1-119-05727-7. Gibson HB (1991). Hypnosis in Therapy. ISBN 978-0-86377-155-2. Glueck, B., "New Nancy School", The Psychoanalytic Review, Vol.10, (January 1923), pp. 109–112. Lynn, Steven (1991). Theories of Hypnosis: Current Models and Perspectives. ISBN 978-0-89862-343-7. Yeates, Lindsay B. (2016a), "Émile Coué and his Method (I): The Chemist of Thought and Human Action", Australian Journal of Clinical Hypnotherapy & Hypnosis, Volume 38, No.1, (Autumn 2016), pp. 3–27. Yeates, Lindsay B. (2016b), "Émile Coué and his Method (II): Hypnotism, Suggestion, Ego-Strengthening, and Autosuggestion", Australian Journal of Clinical Hypnotherapy & Hypnosis, Volume 38, No.1, (Autumn 2016), pp. 28–54. Yeates, Lindsay B. (2016c), "Émile Coué and his Method (III): Every Day in Every Way", Australian Journal of Clinical Hypnotherapy & Hypnosis, Volume 38, No.1, (Autumn 2016), pp. 55–79.